Well 2014 has arrived with a tepid start and already the correction bells are ringing around the financial web. I’m as guilty as the next blogger of trying to front-run corrective moves in the greater markets, but in my experience, it’s rare to see a pack of pundits predicting market direction with collective accuracy. Sure, equities look a touch expensive here depending on which valuation-gauges you’re utilizing, but financial writers around the web(myself included) have been calling for corrections since the last one of note in June. Additionally, I’ve read plenty of analysts who state there’s still value at these stock prices. As the squiggle shows, if this weak start to the year is the genuine beginning to a sizeable(but perfectly healthy) correction of at least 8%, then there will be plenty of time to get properly positioned to take advantage going in and coming out. Notice at the blue circles above, how long the market takes to actually set-up the real dip that shakes things up. 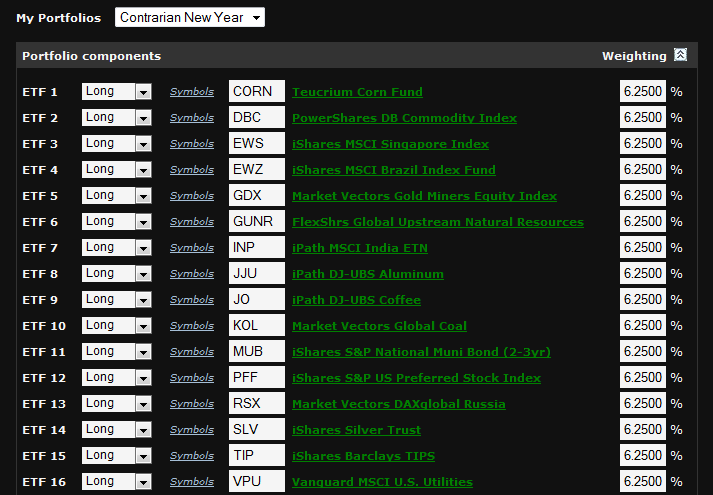 So in the spirit of following what worked last year while trying to include a touch of the contrarian and a dash of new trends, I’ve put together an ETF portfolio that I’d like to track in 2014. Because chasing always works! As always, this is not an investment recommendation. Since buy & hold was an elite strategy for 2013, and really since 2009 apparently, let’s see if 2014 continues to favor buy & hold with good fortune. Let it be acknowledged that this portfolio is only partially constructed using a rear-view mirror, and that investing with one’s view on the rear-view mirror is generally not going to lead to short-term success. The Look Back & Ahead (“LB&A”) portfolio was constructed for short-term results in 2014 only and is looking to utilize prevailing trends and combine them with some of the strategies that had a rough 2013. Eight of the chosen ETF’s follow trends established in 2013. These are Japan(DXJ), Junk Bonds(HYG), Biotech(IBB), Russell 2000(IWM), Tech(QQQ), Share buy-backs and dividends in earnings growth(SYLD), Consumer Discretionary(VCR), and Health Care(VHT). The remaining 4 ETF’s of LB&A are the contrarian plays that could bounce back in 2014. Some of the possible reasons behind any potential bounce-backs are: extended negative sentiment ready for a turn, value at these prices, or hot money moves in together creating a new trend. The 4 trends waiting for a potential 2014 rally off some lows are: Emerging Markets(DEM), Europe(FEZ), Gold(GLD), and Muni-bonds(TFI). You might be thinking muni’s and saying to yourself, “Really?” They’ve had a tough year for sure. Certainly one of the worst performing years in the sector over the last 20. 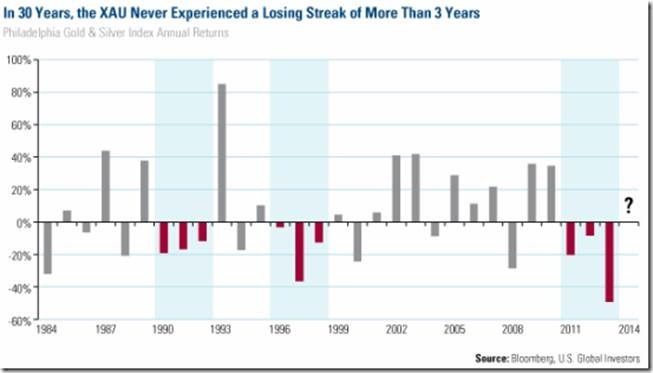 Barclays produced a chart of performance for the past couple of decades. It shows that after a down year, the sector tends to rally quite nicely. Will this time be different? Unfortunately, ETFreplay subscriptions do not provide access to the entire universe of ETF’s. As they state on their website, “As of 2010, less than 500 ETFs have provided >98% of the trading ETF/ETN volume in the U.S. market.” Which means that due to a lack of liquidity and volume, six of the levered plays are not in the ETFreplay database. As such, I am unable to easily save and track the portfolio with their site’s tools. I’ll just save it on another site’s portfolio tools and drum up some charts in Excel for performance tracking purposes. And in the continued spirit of simple benchmarking against the S&P 500, we’ll use SSO(2x levered S&P ETF) as our comparison benchmark. 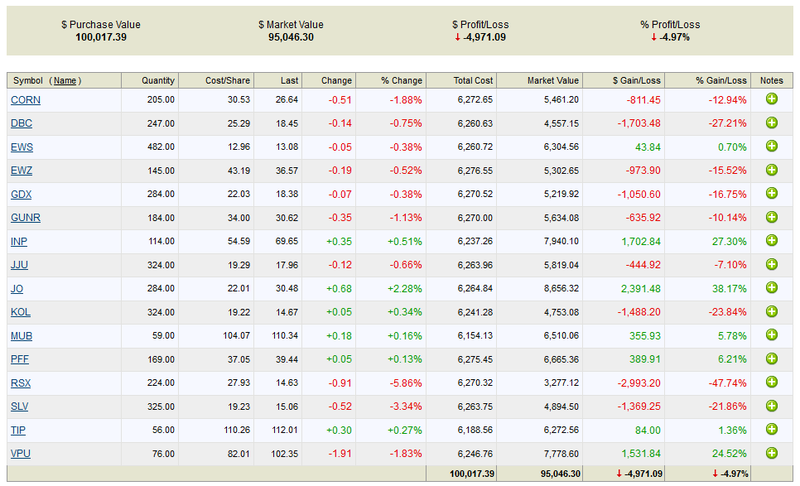 Just for ha-ha’s, we’ll track another portfolio in 2014 of purely contrarian plays. Construction of this portfolio should be obvious to most, but have a look at its make-up. It’s titled Contrarian New Year. Obviously, the BRI of BRIC had a tough year so we’re allocating there for total country exposure. I also included Singapore but left out Turkey. With the ongoing corruption scandal in Erdogan’s government, there’s obviously a whole lot more than sentiment going on there. We’ll just see how that situation plays out and how it affects investor sentiment towards the Turkey ETF later in the year. Commodities were utterly atrocious, so I included DBC and GUNR but also wanted to concentrate performance for some mean reversion specifically in coffee, corn, aluminum, coal, and silver. Gold miners were…well you know the story by now. Utilities was one of the worst performing sectors in the US along with TIPS, as nobody expects inflation and everybody wants to buy growth. We’ll see if inflation starts to tick upward and relative value attracts some players back into the utility space in 2014. Just like muni bonds up above, you may be thinking that the gold miners prove I’m a glutton for punishment. That may very well be, but risk can always be managed, and if the underlying product has a bounce-back year then the producers may see a little pop in performance. Especially if the metal can catch a bid sufficiently past most of the producers’ all-in-sustaining costs. Observe the following chart of the XAU’s performance over the last 30 years, courtesy of US Global investors via Bloomberg. It says to me that miners have a potential low risk/high reward set-up. Believe me, any time the word gold comes out of my mouth, I want to shoot myself in the face. Remember, that these sample ETF portfolios are not investment recommendations and I reserve the right to allocate my own funds as I see fit into or out of any of the fore mentioned investment products. If you’re interested in some of the more professional portfolio metrics and want backtest results, Sharpe ratios, alpha and beta, correlations, etc., then too bad. Go look it up yourself. The name of the game in 2013 was absolute performance and so that is what we are measuring in 2014 with these ETF experiments. And that ladies and gentlemen, is about all there is to basic asset management. Here’s the basic formula: Follow some prevailing trends to cover career risk + buy some contrarian plays based on quantitative models to cover career risk = hopefully benchmark beating results…and winning the grand prize of more AUM, which inevitably leads to diminishing performance. Obviously, I’m highly generalizing here. Asset management in any shape or form is usually performed by very well educated individuals or groups utilizing highly sophisticated quantitative or fundamental models drawn from a wealth of experience and knowledge. I don’t mean to belittle that nor do I begrudge anybody able to obtain a position managing assets. At the higher levels it is a very, very lucrative career that can build high-quality, long-lasting relationships. For now, I’ll continue to trade my accounts, spend time with my family, post to my blog, and pursue interests. Am I going to be nominated for fund manager of the year for my efforts? Certainly not; but I just may have a shot at Dad’o the Year. Now this wouldn’t be a real MarginRich.com article, if I didn’t over-chart the reader. 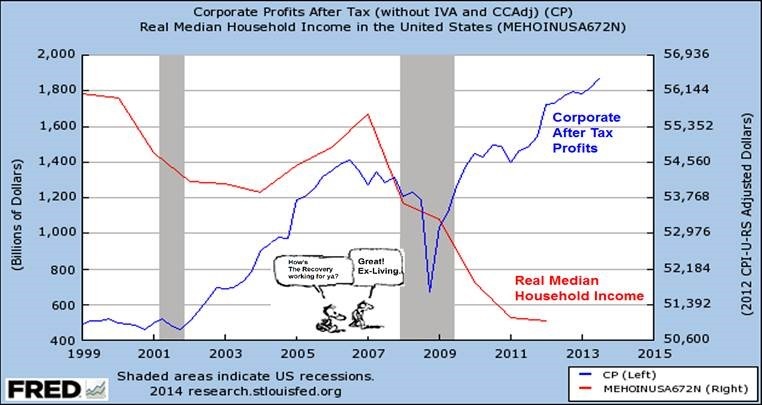 So with that, I’ll bid you adieu with a few charts to provide entertainment and food for thought. 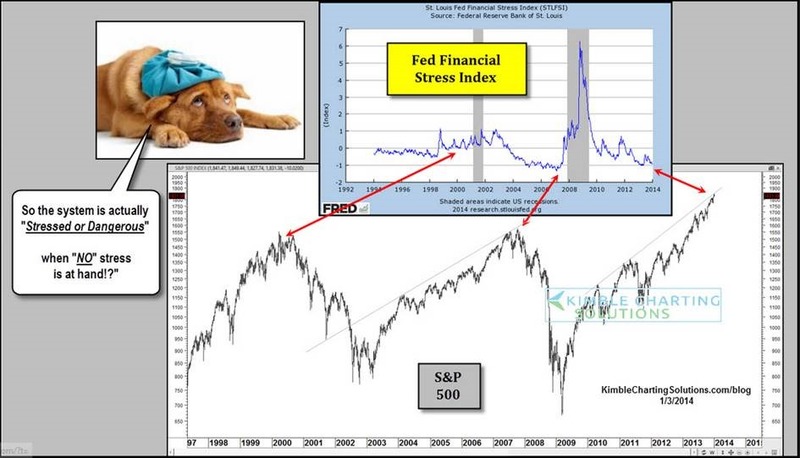 Charts are courtesy of some of the financial blogosphere’s most respected, TRB, Jesse, and Kimble. 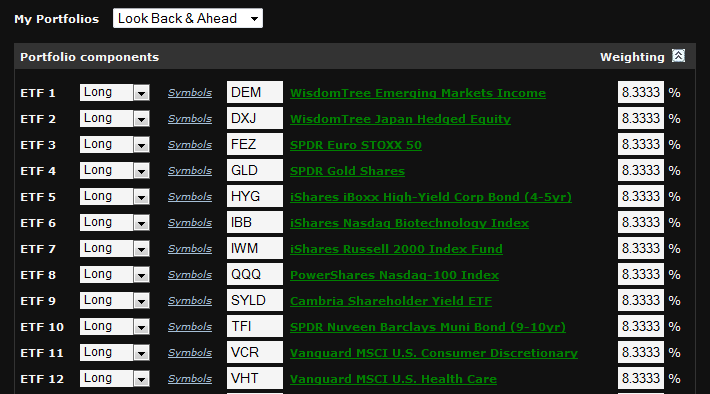 Here’s where I’ll maintain the updates to the ETF portfolios that I outlined in the January 2014 post titled, A Few Sample ETF Portfolios to Watch. If you haven’t read it and are curious as to the rhyme and reason behind these experimental portfolios, then please read the post for a full explanation. The portfolios all started with a “play-money” value of $100K. 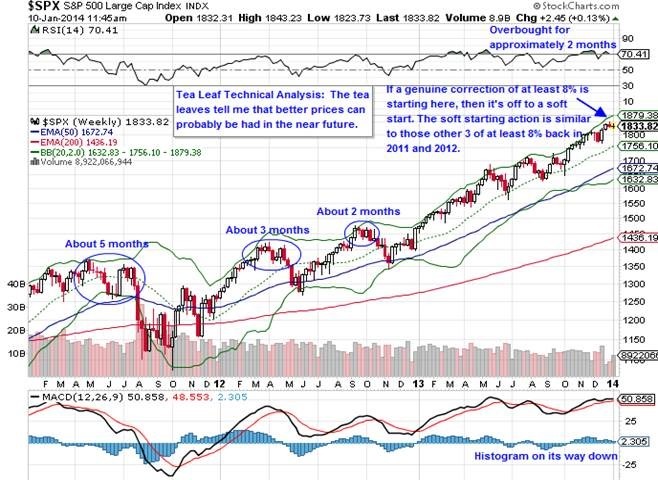 We’ll see how “buy & hold” closes out 2014. CLICK ON EACH TO ENLARGE. Update 1/4/2015: Say goodbye to 2014, the year of nothing specifically working except holding everything. Obviously, the adroit speculator was able to generate income in various and specific asset classes. However, the casual investor trying to pick stocks or even the majority of hedge fund managers were both trounced again by a levered ETF of the S&P 500. So much for trying to follow the trend while also also trying to be contrarian. That little thought experiment crashed and burned. I have a strong suspicion that indexing ain’t gonna be as easy as it’s been the last 2 years but who knows. I’ll leave these results up for the rest of the month and then bid adieu to this specific page regarding the 2014 experimental portfolios. Maybe I’ll come up with something else to add to the site, but at the rate I’ve been posting, don’t get your hopes up. Good luck in 2015, muppets!